On 01 September 2017, UN watchdog IAEA (International Atomic Energy Agency), contradicted President Trump’s claim that Iran is violating the Nuclear Deal. This may complicate President Trump’s efforts to find a rationale to justify statements that Iran is violating the Nuclear Deal, i.e. JCPOA. As reported earlier, the U.S. Executive has to certify to the U.S. Congress that Iran is complying with the JCPOA. Note that the Trump Administration has repeatedly certified that Iran is complying with the two-year-old deal. the blanket energy/economic-related provisions of the Iran Sanctions Act (Section 4(c)(1)(A) of P.L. 104-172, as amended). These constitute the overwhelming bulk of the act’s provisions. The one WMD-related provision of ISA was not waived. The existing six month waiver of ISA was to expire on July 19, 2017, and was renewed on July 17, 2017. The existing waiver is to expire on January 17, 2018. Section 1245(d) of the National Defense Authorization Act for FY2012 (P.L.112-81) that imposes sanctions on countries that do not reduce Iran oil imports. The most recent 120-day waiver was issued by the Trump Administration on May 18, 2017. The next waiver will be due on/about September 17, 2017. Sections 212 and 213 (the economy-related provisions) of Iran Threat Reduction and Syria Human Rights Act (P.L. 112-158) provisions, but not the human rights-related provisions. The existing six-month waiver period was to expire on July 19, 2017, and was renewed on July 17, 2018. This waiver is to expire on January 17, 2018. The United States “de-listed” for sanctions the specified Iranian economic entities and personalities listed in Attachment III of the JCPOA, including the National Iranian Oil Company (NIOC), various Iranian banks, and many energy and shipping-related institutions. That step enabled foreign companies/banks to resume transactions with those entities without risking being penalized by the United States. Request for Congress to Lift Sanctions Outright. The JCPOA requires the U.S. Administration, by “Transition Day,” to request that Congress lift virtually all of the sanctions that will be suspended under the JCPOA. No outcome of such a request is mandated. The JCPOA requires all U.N. sanctions to terminate after 10 years of adoption (“Termination Day”). U.N. Sanctions on Arms Sales and Ballistic Missiles to Be Terminated After Several Years. One issue that arose during final negotiations on the JCPOA was the suspension of U.N. sanctions on Iran’s development of nuclear-capable ballistic missiles and on Iran’s importation or exportation of conventional weaponry. The JCPOA does not impose any specific requirements on Iran on these issues, but Resolution 2231, which endorsed the JCPOA, “calls on” Iran not to develop ballistic missiles “designed to be capable” of delivering a nuclear weapon for a maximum of eight years from Adoption Day (October 18, 2015). 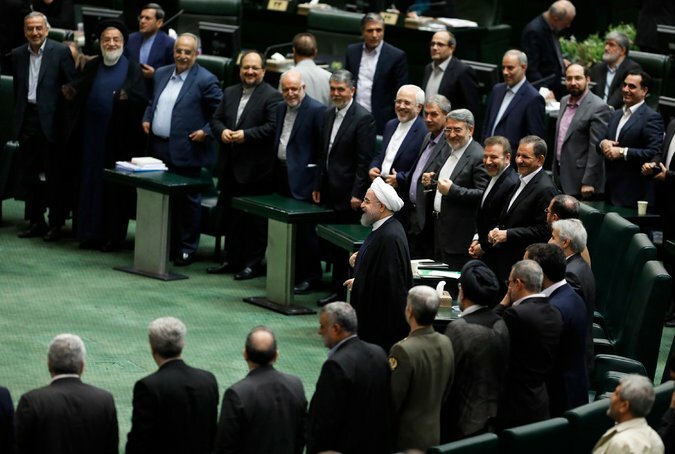 The Resolution bans Iran’s exportation of arms without Security Council approval for a maximum of five years and makes sales of major combat systems to Iran subject to Security Council approval for a maximum of five years. Since Implementation Day, the Administration has sanctioned additional entities, under Executive Order 13382, for involvement in Iran’s continuing tests of ballistic missiles, as depicted in the tables at the end of this report. and the Treasury Department revised its guidance in October 2016 to stress that such transactions are permitted. Under a U.S. Policy Shift or for Iranian Violations Should the incoming Trump Administration decide to abrogate the JCPOA, one potential scenario would be to unilaterally reimpose those sanctions that were lifted. The President could reimpose those Executive Orders that were revoked, and terminate the waivers that were issued to implement the JCPOA. Doing so would render foreign firms vulnerable to U.S. penalties were they to enter into transactions with Iran that were again made subject to U.S. sanctions. A related question is whether the effect of sanctions currently realized could ever be reconstituted if the United States alone reimposed sanctions. The effect of sanctions depended on the substantial degree of international cooperation with the U.S.-led sanctions regime. A wide range of countries depend on energy and other trade with Iran and might be reluctant to resume cooperating with U.S. sanctions unless Iran commits a material breach of its JCPOA commitments. However, many foreign companies might be deterred from transactions with Iran if U.S. sanctions were reimposed, in order not to risk their business prospects in the United States. According to the IAEA, Iran’s stockpile of low-enriched uranium is well within the agreed upon limits under the JCPOA. For that matter, Iran’s stockpile of heavy water is also below the agreed limits. The IAEA latest report, which was leaked, comes at a critical moment, as President Trump continues to threaten not to certify Iran’s compliance with the nuclear deal. The next certification report to U.S. Congress is expected in mid-October 2017. There are reports that the White House is pressurizing governmental officials to report Iranian JCPOA infractions, which could pave the way for the U.S. to withdraw from the nuclear accord. In this context, Israel has also accused Iran from establishing missile production sites in Syria and Lebanon. This pressure has also included a trip of the current U.S. United Nations ambassador, Nikki Haley, to the IAEA headquarters in Vienna, in which she pressed the watchdog to implement a more aggressive inspections regime, and to focus on Iran’s military sites. Until now, the other signatories of the JCPOA, have stated their commitment to the deal. They will probably not revoke the deal without credible evidence that Iran is not honoring it’s JCPOA commitments. The IAEA director, Yukiya Amano, has defended it’s agency monitoring responsibilities vis-a-vis Iran’s JCPOA commitments. Firstly, he, rightly emphasizes, that the IAEA is a fact-finding organization, geared towards verifying facts and not a political organization. As we saw in the case of Iraq, the independence of the IAEA should be guarded, as it should deliver objective information to UN member states and the UN Security Council. Secondly, the IAEA has the power to inspect any “sensitive,” locations – military or civilian – that it deems necessary to verify Iran’s commitments to the nuclear deal. In this context, to compel access to suspect locations, the watchdog only needs the approval of five of the eight signatories to the agreement. However, the watchdog will only do this on the basis of credible intelligence. Note that during her trip,according to the IAEA, ambassador Nikki Haley did not disclose any information which justifies the inspection of military sites. However, the IAEA’s inspection regime has been criticized by two former IAEA inspectors – David Albright and Olli Heinonen. These two are critical of Tehran’s attitude towards the nuclear deal. They published an article in which they argue that the UN watchdog could make better use of provisions in the JCPOA to verify that dual-use items are not being used to violate the nuclear accord. This could include the inspection of military sites to confirm that dual-use items are not being used to research warhead design. As usual, the knee-jerk reaction of Iran is not helpful. It’s clear that President Trump is not happy with the JCPOA. However, the question is whether it’s wise for the U.S. to withdraw from the deal, instead of enforcing it. An unilateral withdrawal of the U.S. would certainly isolate it from it’s allies, which an already embattled Trump Administration does not need. Unclear is whether allies would accept the re-imposition of U.S. sanctions, especially secondary sanctions. This would certainly not help U.S. companies – especially those already legally conducting business with Iran. A wiser course would be for the U.S. to enforce the JCPOA; provide the IAEA with sufficient evidence in order to verify not only Iran’s compliance, but also to maintain some unity with other JCPOA signatories to ensure that the nuclear deal is a success. When trying to achieve peace, what both ambassador Haley and Mohammad Bagher Nobakht could consider; is that there are two types of dreams, those which are fulfilled, and those which should be. Be the first to comment on "UN Watchdog IAEA contradicts President Trump’s claim that Iran is violating Nuclear Deal"